It’s a fact of life that every business has good days and bad, no matter what they trade in. Commercial rewards from food outlets seem hostage to so many subjective fortunes but proprietors must be doing something right when hungry hoards descend. 30th May 1863 was such a day for two eateries in Buxton. At 3pm, guests of the London & North Western Railway tucked into a late lunch, celebrating completion of the company’s line from Whaley Bridge. An hour earlier, a train load of dignitaries had sat down to gorge at the Midland Railway’s table, brought through the Peak District’s limestone landscape via a brand new route from Rowsley. It was, no doubt, an intoxicating day in the town. What the Midland’s management could not have foreseen was that their heavy engineering - 3,500 yards of tunnel, two major viaducts and a handful of minor ones - would remain operational for barely a century. Pullmans arrived in July 1960 - “the last word in rail comfort” - but even they failed to save the day. Eight years later, with local and freight traffic already gone, the few remaining expresses were diverted along the Hope Valley, bringing the curtain down on a remarkable railway. 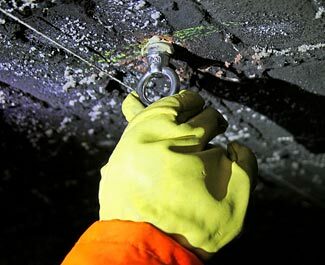 ...to attached fixings for the lights in Chee Tor No.1 Tunnel. But its trackbed is no longer silent. In 1981, the Peak District National Park Authority (PDNPA) concluded lengthy negotiations with British Rail to secure the land it occupies, not to mention a £154,000 contribution towards repair of the structures. Across them was laid the Monsal Trail - a nine-mile path linking Blackwell Mill Junction, east of Buxton, with a bridge over Coombs Road on the Matlock side of Bakewell. Etched for part of its length onto a ledge above the River Wye, it offers some grand vistas as well as bringing function to the listed viaducts at Monsal Head and Millers Dale. Whilst it has proven hugely popular, it is not the gentle linear stroll that you might expect of a railway path. Four quarter-mile tunnels have remained closed for safety reasons; to avoid them, the trail is diverted up hill and down dale, making end-to-end journeys difficult for walkers and nigh-on impossible for those on bikes. Although the authority has held a long-term aspiration to thread the path through the tunnels, the funding issue has been insurmountable. Until now that is. In 2009, the PDNPA was approached by Cycling England - a dying quango within the Department for Transport - with potential funding for a project to encourage people out of their cars and onto bikes. Helping to fulfil that goal is a new cycle track across the Peak District, linking the rail stations at Matlock and Buxton. £2.25 million of DfT money has been earmarked for the capital project, sitting alongside a programme of social marketing. 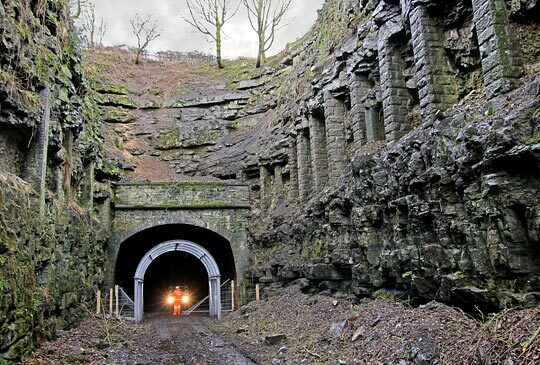 Phase 1 delivers a quick-win by joining the four disconnected sections of the Monsal Trail via Headstone, Cressbrook, Litton and Chee Tor No.1 tunnels. Two others - the short Chee Tor No.2 and Rusher Cutting - have been part of the route since day one. The 2½-mile missing link between Coombs Road and Rowsley, where a path from Matlock currently terminates, features another disused bore - this one created largely by cut and cover to prevent the railway blighting the Duke of Rutland’s outlook from his seat at Haddon Hall. 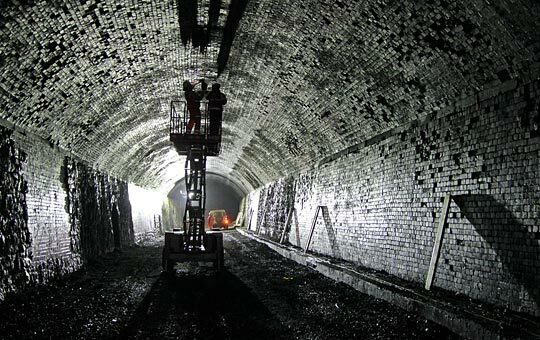 Work taking place at the western end of Chee Tor No.1 Tunnel, viewed from the shorter Chee Tor No.2 which has been part of the Monsal Trail since its beginning. 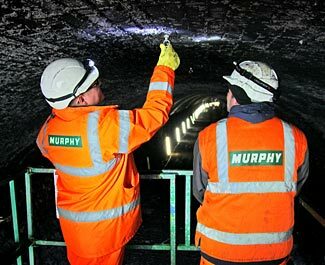 The first step towards reopening involved the commissioning of five major surveys - three dealt with ecology, archaeology and bats whilst two more examined the structural condition of the route’s bridges and tunnels, undertaken respectively by White Young Green and Donaldson Associates. The latter identified immediate needs resulting from the decline that inevitably accompanies water ingress and withdrawal of a maintenance regime: high-volume repointing coupled with spot repairs to address areas of spalled lining. “They are in remarkably good condition bearing in mind the lack of attention they’ve received over the years” insists Rhonda Pursglove who’s managing the project on behalf of Pedal Peak District, part of the National Park Authority. Those surveys helped to map the way forward. Much of the trail is a Site of Special Scientific Interest (SSSI) so it was important to identify species or areas of sensitivity that needed protection from the contractors’ machinery and workforce. Like the cupboard under your stairs, the tunnels had become home to unwanted clutter, amassing 500 tonnes of junk. There was even a kitchen sink in one. 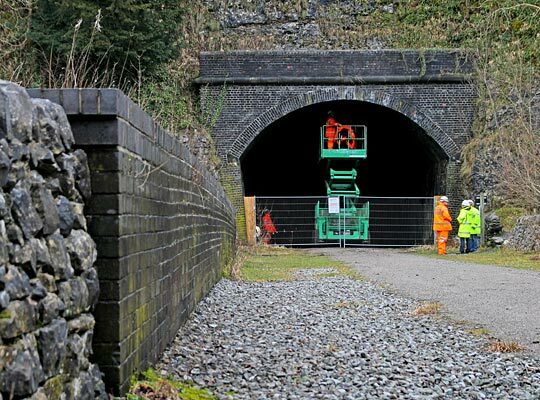 Its removal afforded Barnsley firm Amco the access it needed to carry out short-term repairs as well as relieving the tunnels of the steel doors and blockwork that had kept the public out. This changed their microclimate - December’s cold spell saw hundreds of icicles form, many of them roof-to-floor. The outstanding cutting at Headstone Tunnel’s eastern end has the special designation of a geological SSSI thanks to its distinctive rock strata. But evidence was apparent of past boulder drops from above the portal - clearly a significant safety risk. So another of Amco’s tasks was to erect a galvanised steel arch as a protection measure. The company also refurbished the concrete housing that accommodates a water main at the foot of the Down-side wall in three of the tunnels. 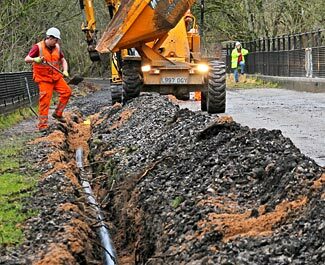 Here, workmen dig a trench over East Buxton bridge to accommodate the ducting. Although there are a few precedents elsewhere, public safety precluded any prospect of the tunnels being left without lighting. How though to deliver it? Feasibility trials were carried out to establish the appropriate equipment and optimum light levels. But given their isolation, the biggest challenge would always be the electricity supply. Solar was discounted at an early stage due to the size of the requisite panels and their inability to guarantee sufficient power. Time and potential technical constraints ruled out a borehole option from the community of Monsal Head which overlooks one of the listed viaducts. So Cardiff designer Vitec Webber Lenihan came up with a low-voltage low-cost scheme that involved running a cable to Chee Tor No.1 Tunnel from the former station at Millers Dale, about half-a-mile away, whilst the other three would be supplied via a Padmount transformer sited at Monsal Halt, tapping into an existing 132,000V source there. This would demand about a mile of cabling. Arriving on site in mid-January to fulfil this element of the project was contractor J Murphy & Sons. Its role was complicated by the sensitive nature of the corridor - all works required SSSI consent from Natural England - and the ongoing use of the trail by walkers. A strict method statement stipulated how the work would progress, with trenches dug, ducts installed and material backfilled quickly to minimise its impact. Murphys have had to be conscious of that public presence, fencing-off areas where people and plant would come into close proximity. In the tunnels, fluorescent lighting is being suspended from the arch, sitting about 1m below the crown and providing around 20 Lux. Not yet installed, the 3m tarmac surface will be dressed with Toptrek - a partly recycled material used elsewhere on the trail - or a limestone dust to ensure as much light as possible is reflected. The soot-covered walls absorb almost everything that’s thrown at them. The authority is understandably conscious of ongoing maintenance liabilities so the units are long-life - lasting about 80,000 hours each - and offer three hours of emergency lighting in case of power failure. March will see the work substantially completed - the end-date stipulated in the DfT contract for monies to be spent. 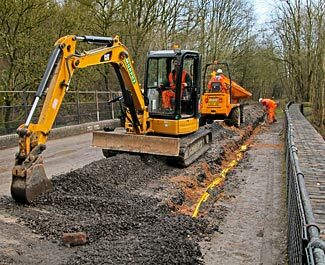 Over the intervening period, the sections of trail over Monsal Dale Viaduct - connecting Headstone and Cressbrook tunnels - and between Millers Dale and Blackwell Mill will be closed as the surfacing work there entails extensive plant movements. And one fly has landed in the ointment from across the Atlantic: Central Networks’ US-based Padmount provider has gone bust, delaying work to secure the electricity supply needed for the three easterly tunnels. A switch-on in May/June looks realistic. The impressive cutting at the eastern end of Headstone Tunnel. A galvanised steel arch will protect trail users against falling rocks from above the portal. The Midland’s railway was driven by its expansionist ambitions, challenging the LNWR’s dominance by reaching out to Manchester. The culture was very 19th Century. But it’s all change in the 21st, with both the current and previous governments keen to promote a more sustainable approach to transport. Whilst the creation of a cycle route is ‘off the beaten track’, the investment of public money in such a project puts a marker down about future priorities. Peak Cycle Links has recently been formed to develop the two remaining phases beyond the National Park boundary, connecting the reborn Monsal Trail to the wider cycle network. Given the tight belt now constraining the public sector, it will face a challenging climb to raise the necessary funds, although those involved still seem optimistic. In the meantime, with two cycle hire ventures planned for the trail, the opportunity to glory in the tunnel engineers’ handiwork - and the countryside between them - is about to present itself. 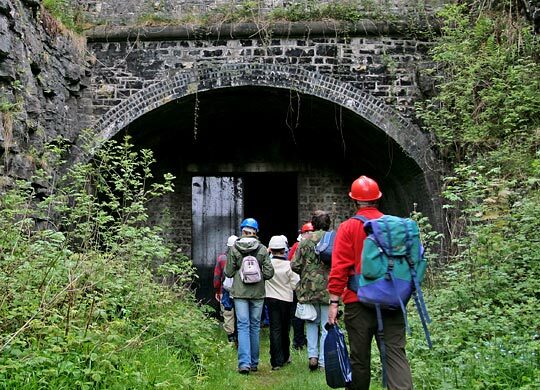 Adventurers enter Cressbrook Tunnel on a 'guided walk' provided by the National Park's ranger service.